Designed to integrate seamlessly into the S1 Tower and similar style harnesses this batten seat features a stable platform, with secure connections and two extra D rings to support your gear. Designed to Safety One’s standards this batten seat is designed to mount quickly and securely to any harness with a ventral connection point and provide you with a stable, comfortable seat which will allow you to focus on your job, not your harness. The straps that connect the seat to the harness use 5,000 lbs. 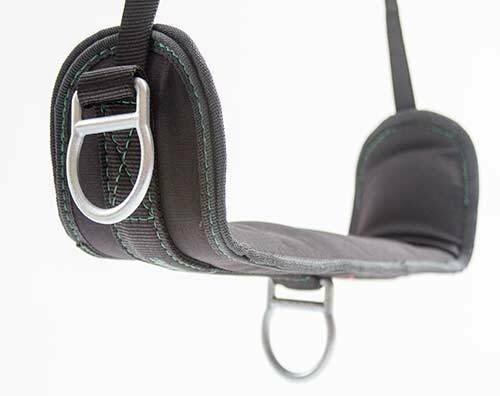 min rated webbing and connection hardware to provide the strongest seat on the market. The two rated work positioning D-rings allow the user to position themselves comfortable to do the required work. The rated D-ring on the bottom allows the seat to be flipped over and used as a spreader for confined space rescue. Whether you’re working from ropes or on towers this seat will help you stay comfortable!